Listening to your favourite tracks couldn’t be simpler. With a wireless NFC connection, just tap your phone on the speaker and you’re in business. Nokia may have partnered with Monster for its last batch of Lumia-focused audio wares, but now JBL is also in on the deal. 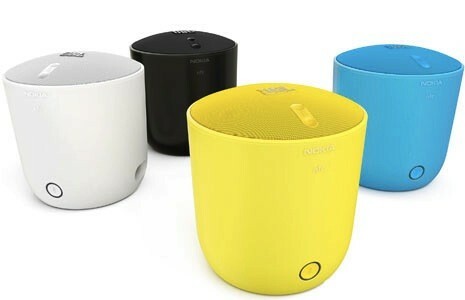 Say hello to first product from Nokia and JBL, the successor to the Play 360 portable speaker, dubbed PlayUp. The noiseybox is packed with Bluetooth and NFC, and as for the design, it’s made to complement “current and future Lumia smartphones.” Like the Play 360, the PlayUp is a cylindrical, top-shooting speaker with physical volume controls, a large power button near the bottom and a 3.5mm jack for plugging in PMPs. The PlayUp weighs 760g and it measures in at 118 x 118 x 128mm — a fair bit chunkier that the 360 (110 x 110 x 124mm and 514g). Despite the heft, the PlayUp’s battery is rated for 10 hours of use, which is disappointingly just under half of the 360’s replaceable cell. Charging gets handled via micro-USB and — thankfully — a wall adapter is included. Naturally, the notable change is JBL’s baked-in audio expertise. The unit can pump out a healthy 89dB of volume (aided by a bass port), which isn’t shabby, but still shy of the ear-ringing 120dB the $99 UE Mobile BoomBox can produce. There’s no word on whether tow units can pair wireless stereo like its elder, or what version of Bluetooth is packed inside, but we’ll be sure to let you know once we find out. Nokia also plans to release an app for the device to allow for remote control. Given that Nokia has knack for consistency across its products, it’s likely that the white, black, cyan and bright yellow color choices will match up with the WP 8-loaded Lumias at their September 5th unveiling. The PlayUp will be available for €149 (about $186) before the year is out, which includes a travel pouch and a 3.5mm audio cable. In the meantime, hit the source link for more details. Buy it now in our store for $149.